DETROIT– For some, it’s a war zone. For others, it’s home. Life and death play out in this east side community among the few who refuse to give up on the 48205 ZIP code. Part of the area has been dubbed “The Red Zone”— gang turf for the Seven Mile Bloods who, authorities say, terrorize residents with shootings, murders and drug dealing, as detailed in a The Detroit News series this week. 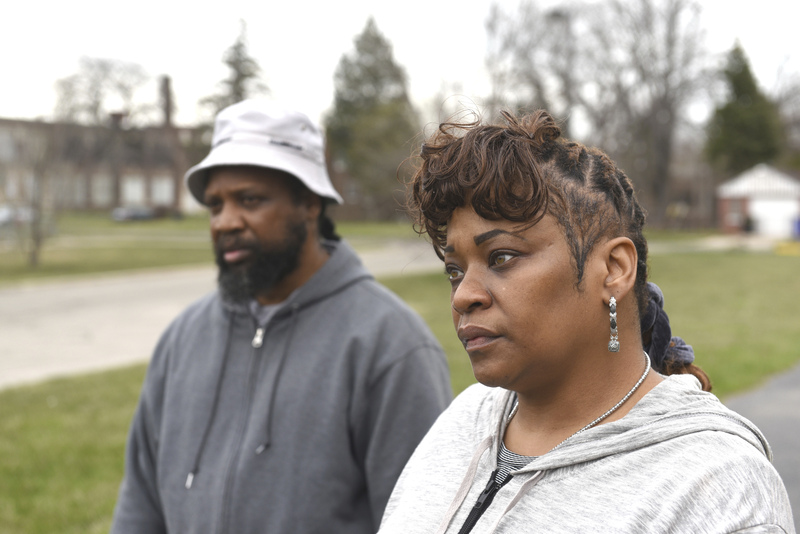 Authorities are using federal racketeering laws to try to stem the violence and disrupt the war, which stretches between Seven Mile and Eight Mile, east of Gratiot and west of Kelly. Activists say the gangs represent only a small pocket of their neighborhood and that most residents simply want to raise their families, clean up blight and live in peace. And they say there is a concerted effort underway to do that. “I like to paint the picture of my community as a community that’s on the rise,” said DeShawn Hurt, president of the Regent Park Community Association, which covers areas in The Red Zone. “There’s a lot of people over here that want better for our community. Some residents say they see gang members arguing and firing weapons on street corners. A few of those intersections hold symbols of despair. Makeshift memorials with weathered stuffed animals and red bandanas dangle from utility poles; dozens of empty liquor bottles lie below. The streets are lined with abandoned, boarded-up houses and structures marked with black or red graffiti. Empty lots are covered by overgrown grass, old tires and litter. On a recent spring afternoon, a man scooped fresh topsoil from a wheelbarrow onto his neighbor’s lawn on Tacoma, a small child twirled along on a sidewalk and a couple walked their two dogs on a trail surrounding Heilmann Recreation Center — a space that provides activities and community events. At nearby blacktop courts, teen boys played basketball, their voices echoing over the sounds of chirping birds and bass from a passing car. Groups are teaming up for neighborhood watch programs. The staff at Heilmann touts a growing list of sports and after-school programs. And the faith-based nonprofit LifeBuilders Detroit on Kelly is restoring abandoned homes and hosting day camps. Detroit police say they are working to eradicate gangs in The Red Zone, located in the department’s 9th Precinct, with such programs as Operation Ceasefire, which connects gang members or residents who are likely to commit crimes with social services and mentors. This animated map shows the location of homicides in the 48205 ZIP code since 2009. Operation Ceasefire is credited with reducing crime in 48205 since it launched in 2015. In the 9th Precinct, combined homicides and non-fatal shootings dropped from 246 in 2015 to 181 in 2017. Detroit Police Capt. Rodney Jackson said the department also has made a greater focus on gun-related crimes, such as carjacking, robbery and felonious assault. This has allowed police to catch criminals before their violence elevates to homicide, he said. “We are slowly changing the culture over there,” Jackson said. Last fall, the Michigan State Police ended patrols in the 9th Precinct following a controversy involving a 15-year-old ATV driver who died after a state trooper used a Taser on him. Jackson said while the state police provided another layer of police presence to the area, the loss has not impacted the department’s ability to reduce crime. View a 360-degree tour of one ‘Red Zone’ neighborhood, a mix of well-maintained homes and abandoned, burned, and boarded up ones on Tacoma and Manning streets east of Gratiot Ave. The longstanding Heilmann Recreation Center serves about 70 percent of the youth in the neighborhood, according to center supervisor Byron Spivey. The center offers soccer, basketball, cursive writing classes, water aerobics, Zumba and other activities. Spivey, who joined the center in 2006, said overall gang activity appears to have calmed down in the last 12 years. Spivey recalled days when gangs would fight in the open field next to Heilmann and staff would have to chase them off. Now families can walk to the center without experiencing problems, he said. Spivey and other activists agreed that poverty, broken families and lack of jobs are the key issues driving much of the crime here. Mayor Mike Duggan said he has personally attended call-in meetings with known gang members through Operation Ceasefire. “We have a long way to go, but we are seeing progress in reducing the level of gun violence in this area,” Duggan said in a statement. But some residents say the change isn’t happening fast enough.